Okay, probably not the post most would be expecting for a Christmas story, but trust me, it’s valid. 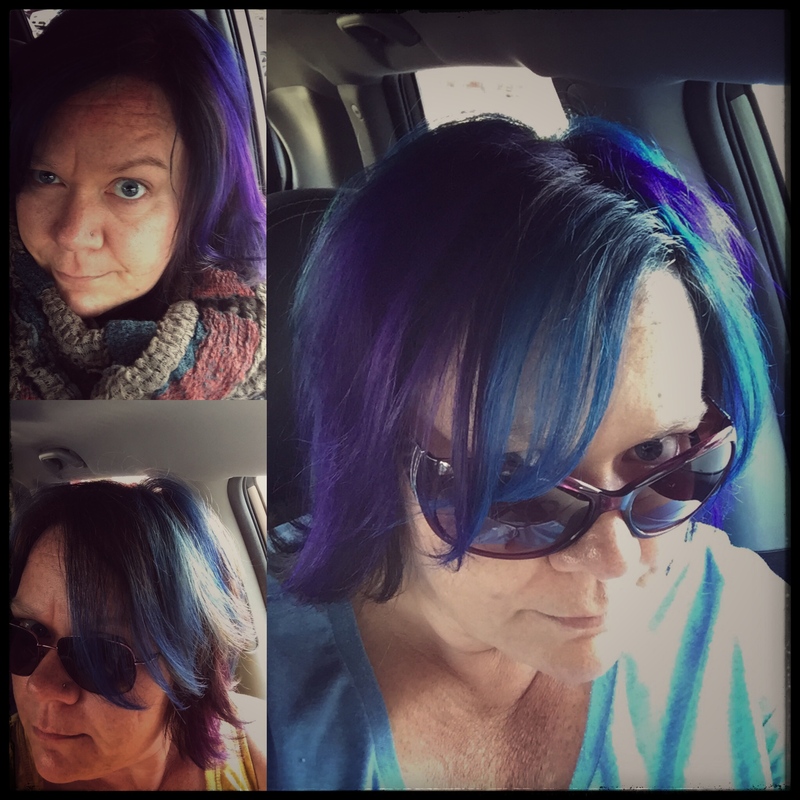 Plus I just got my hair recoloured, so how could I pass up a chance at showing it off (top left pic). Every main character needs a best friend (well in my books they do), someone who is there to banter, support, and annoy all in the name of friendship and love. 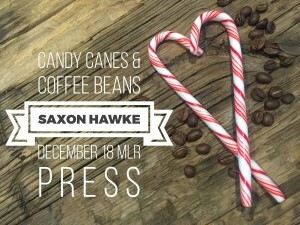 In Candy Canes & Coffee Beans, Lulu is Asher’s BFF. And it’s not only her personality that’s quirky. With purple hair and ink covering most of her body, what she lacks in height she makes up for in presence. Barista by day and tattoo artist by night, she was a fun character to write. But despite our matching hair and ink, she was not based on me. I just gave her a few things that I love. I’m very much like Asher in that I love to make people smile. It was a thing my mom used to do, and I’ve taken up the mantle. During the holiday season, with all the stress that grows as Christmas Day gets closer, I turn up the cheer. The minion hates it and he tends to pretend that I didn’t give birth to him. But hey, I’ve had a few retail people, who’d been close to tears, smile because of something I’ve said or done. To me? That’s the best feeling in the world. Although my biggest weapon in the Battle of the Smile has been my humour, lately I’ve been amazed at the reaction people have had to both my tattoos and my colourful hair. 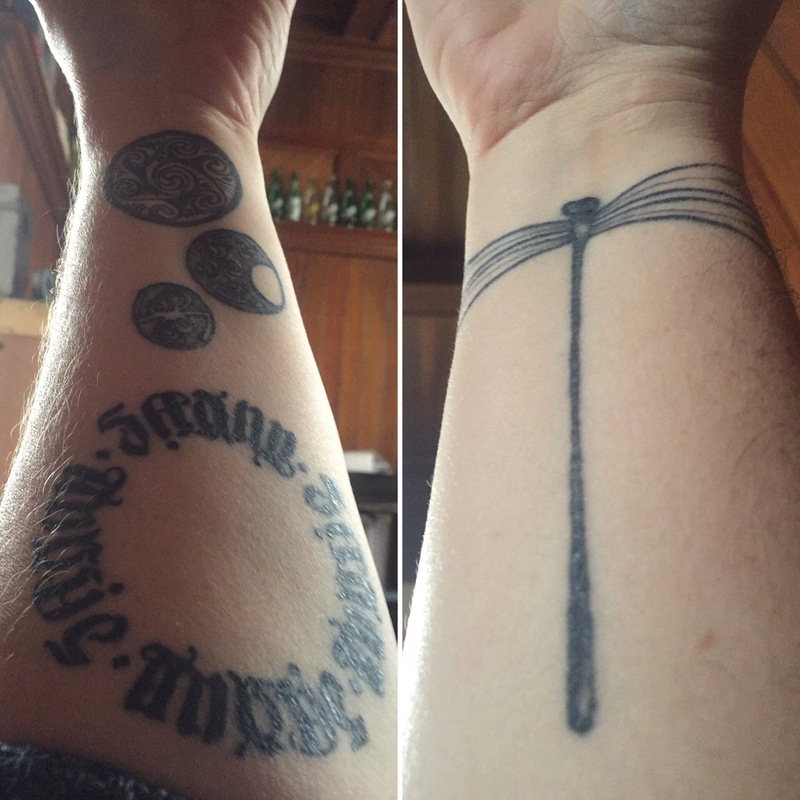 I’ve had my tattoos longer than the blue in my hair, my first appearing about three years ago. It’s the dragonfly I designed in memory of my mom. It’s simple, and if you saw the top of my wrist, you’d think I was wearing a bracelet. And that’s what people usually react to. I’ll tilt my wrist so they realize it’s actually a tattoo and they’ll smile and tell me how beautiful it is. Of course I’ll then relay the meaning behind it and they turn to mush. 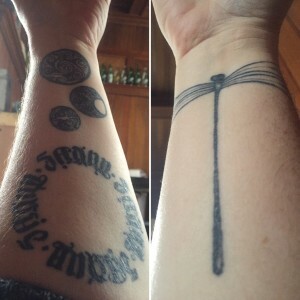 All of my tattoos have meaning to me, and I think people respond to that. The hair thing has been my biggest surprise. I’ve had the odd pink or purple stripe in my hair before, but I worried, for about thirty seconds, that dying so much of my hair purple and blue would look ridiculous on a forty-five year old football mom. Those worries went away pretty quickly, and since February, I’ve added more and more colour. I think everyone at GRL either saw or heard about my hair (and my purple fingers thanks to the humidity). I feel good being different, and I really couldn’t care less if people think I’m not “acting my age”. To my surprise, I have had people, ranging from five to eighty-five, freak out about my hair. Freaking out in a good way. But maybe it’s because I’m a forty-five year old football mom who doesn’t care what other people think. 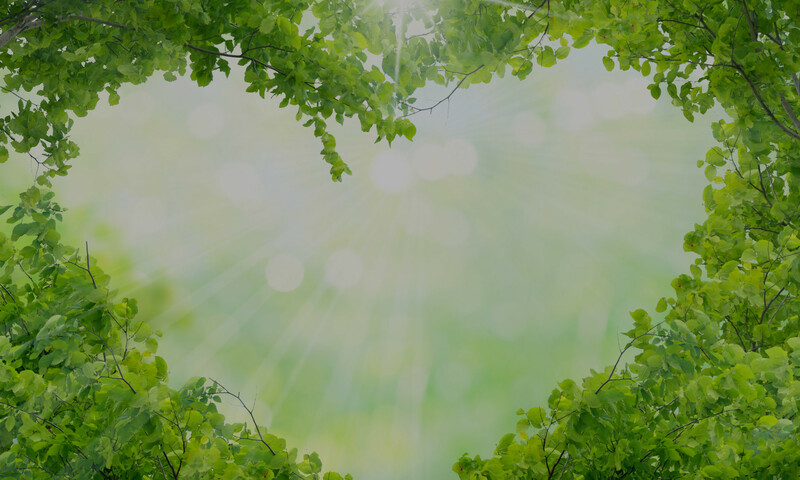 That I’m doing something that makes me feel good and confident about myself which makes people smile, appreciating a bit of fun in a world that is getting a little dark at times. All I know is that people smile when they see me, and that makes me happy. And I think Asher would approve of that.